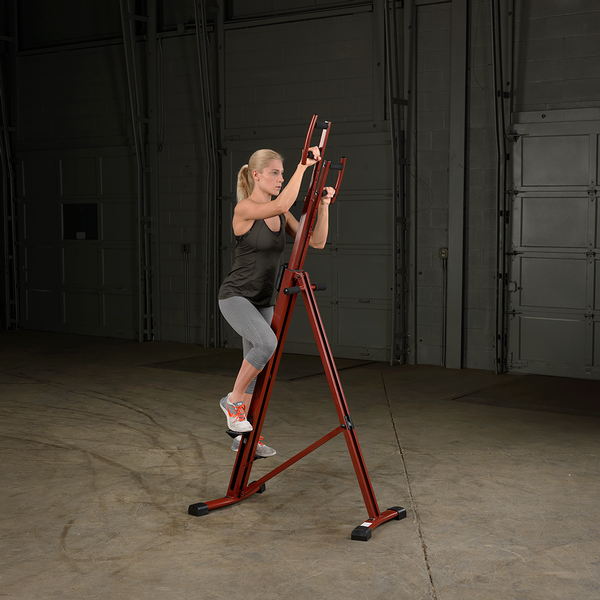 This week, Body-Solid introduced their latest product innovation: the Best Fitness BFMC10 Mountain Climber, a lower body stepper and upper body climber together in a single compact, affordable machine. The BFMC10 joins Best Fitness’ extensive line of cardio equipment including the BFCT1 Cross Trainer, BFRB1 Recumbent Bike, BFSB5 Indoor Training Cycle, BFE1 Elliptical, BFUB1 Upright Bike and BFSB10 Exercise Bike. The BFMC10 gives users a total body, vertical workout that activates, tones, strengthens and builds several major muscle groups like legs, shoulders, hips, glutes, abdominals and core. For those looking to lose weight, mountain climbers like the BFMC10 burns more calories per workout than treadmills, ellipticals, bikes or other cardio lower body only machines. The BFMC10 can be easily stored, folded and moved making it an ideal fit for space-restricted home workout spaces or garage gyms. If you’re in need of a true total body, non-impact cardio workout then look no further than the new Best Fitness BFMC10 Mountain Climber. For more information on the BFMC10, visit our product page at bodysolid.com/Home/BFMC10/Best_Fitness_Mountain_Climber, email sales@bodysolid.com or call (800) 833-1227.